At VCFMW this fall, this small board was passed to me to see what I could do with it. The silkscreen on the back indicates that it is from IC Station. It is designed to allow a user to connect a PS/2 keyboard to a computing device without having to poll the keyboard signals directly. It provides an 8-bit parallel output, a 5v serial output, and either I2C/TWI output. Our original thought was that the adapter would allow us to connect a PS/2 keyboard to a vintage computer that required a parallel input. However, upon connecting a keyboard, and monitoring the signaling, I discovered that it was only mirroring the values provided by the keyboard to the parallel, serial, and IIC/TWI outputs. I set it aside, until I had a chance to look at it further, which I did a short time later. Examining the system closely, I realized that it uses an STM8S003F3 processor. This is a small 8-bit MCU with 8Kbytes Flash, 1Kbytes of SRAM, and 128 bytes of EEPROM. It has an internal clock, capable of running at 16Mhz, three timers, and 16 I/O pins. 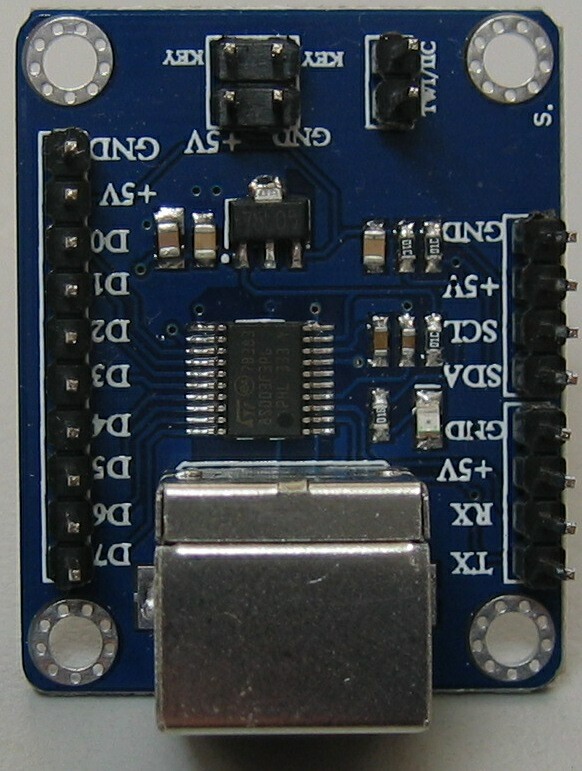 It uses a single wire interface module (SWIM) for development and programming. With that knowledge, I ordered an ST-Link programmer and waited for it to arrive. 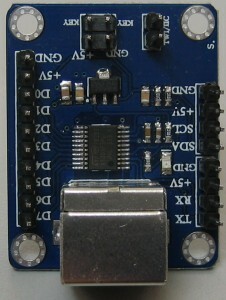 Upon arrival, I soldered a wire to the reset pin to the board and connected the programmer to read the contents of the embedded Flash. Unfortunately, this processor has a read out protection bit, and it was set. As a result, I was unable to read the existing program. However, I could reset it, and clear the Flash, which I did. I was then able to program it with my own program, which reads the values from the PS/2 keyboard and then uses a table to convert them to the correct ASCII values. These values are presented on the parallel data lines, and the KEY pin is toggled as a strobe. The Apple 1 requires a reset and clear screen option, which I mapped to F1 and F2. I use the SCL to act as the clear screen output and the SDA pin to act as a reset. The board will need a protection diode on the clear screen line, much like I discussed when attaching a Texas Instruments Keyboard. Mike Willegal uses this same technique for his PS/2 Keyboard adapter. The Flash memory contains plenty of room for additional features and this could be used with a mouse, keypad, or the two PS/2 pins could be used as generic I/O pins. did you test the parallel data if they are present or not. In my case the data is not present. I took a look at the output of one of these this morning. The pin marked key outputs a high while a key is pressed on the keyboard. On the parallel side, the ps/2 key code is output until a new key is pressed. The parallel side appears to be delayed by around 5.5usec from the key output. If the led blinks when you press a key, then the serial output is working, as the led is connected to the TX output.